Hope this email finds you strong and healthy. Believe me it quite exhausts them. Boxing is done on Wednesday and Strength work Monday and Friday. 35 players have commenced Strength training , some have trained more than others over a 10 week period twice a week. 11 players who have trained more than 8 workouts have increased their strength from 30 % to 62 % , granted they started with moderate weights, I will check again in 8 weeks. One of my strength athletes who is only 17 years old, was dipping and chinning with his bodyweight for 8-10 reps , he now dips and chins with 22 pound around his waist, for 8 reps good improvement. Obviously I need to get more of our players to be more consistent, but most are coming on board and having a full body workout once to twice a week. Workouts take 30 to 35 minutes and each exercise now, is completed for 1 hard to the floor set of 6 to 10 reps, when they reach their goal in reps the weight is increased, always in good form. The advice you gave me is working very well. Our Club is the only Club in Town who strength trains their players. Editors Note: Great work David! Keep us updated. I think your much stronger team should dominate. 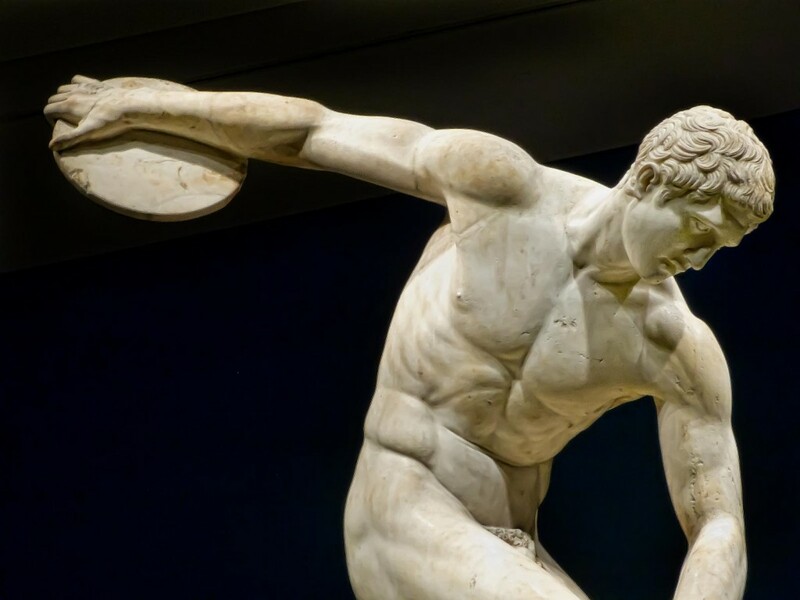 There's a reason that ancient Greek statues look the way they do. I believe that it's the perfect physique and I seriously doubt that those sculptors would base the statue on any drug induced trainer of the modern era, as they look like a science experiment that went wrong. In my opinion the greatest natural physiques that normal men could hope to achieve ceased to exist after the late 50's. I remember watching a certain 70s documentary as a young impressionable boy about bodybuilding legends in Venice Beach, I didn't realise until I was older and started really educating myself about the iron game that these guys were all on steroids . Up until this point I'd foolishly believed that if I just trained, longer, harder , and exactly like they did then I'd look like them. It's kind of like that moment when you find out as a kid that Father Xmas does not exist and it was a lie all along. Lifting weights was supposed to be a health benefit, eating healthy, training hard, progressing, thats the reason why I still haul my carcass into my freezing garage to try and get stronger and fitter than before, and I'm sure you all do the same. But the current climate of strength and fitness sports seem to revolve around who can abuse the most body altering drugs whilst lying to everyone around you that you are natural and did it all yourself. Natural trainees do not usually have 20 inch arms with 5 percent body fat, those people are either in the top 1 percent of the top 1 percent or are on something. That's not me, and I doubt that it's you otherwise you wouldn't even be on here reading these articles. Have you ever noticed that the old-time bodybuilder's and strength trainers still looked great in their 50s 60s and 70s ? Whilst nowadays 3 years after retiring modern bodybuilder's look like a guy who's never lifted in his life? We've all seen it happen, even to people around us . The reason ? Real strength training builds real muscles and real physiques for real people . That's a fact that's been known since Milos Of Croton lifted a calf everyday until it became progressively heavier. I'm pretty sure he didn't have access to testosterone other than his own either. Being strong and healthy is a benefit that most people take for granted until it's taken away from them, to abuse that by cheating is just cheating yourself in the long run . The greatest physiques ever built were built naturally using just hard work and determination. Last year I went to the biggest fitness expo in Europe, the look nowadays seems to be big arms, no back, no legs, big shoulders. It's horrifying if im honest, the majority of these guys would be lucky if they weighed more than 170lb and could bench more than 120lb if I had to guess. Sometimes progress is a bad thing, and the only light at the end of this very dark tunnel is people like Mr Whelan and his friends writing and keeping the real business of strength and fitness alive. My clients commonly ask me questions about when to eat. A recent article on Meal Timing spurred me to write this article (below). Perhaps it will offer some food for thought, and help you plan your meals for health as well as for energy and performance. I hope you enjoy the information. Meals and snacking patterns have changed over the past 40 years. You have undoubtedly noticed that many of us are eating fewer calories from meals and more calories from snacks. As a result, I get questions from both athletes and non-athletes alike about how to best fuel their bodies: Should I stop eating after 8:00 pm? Which is better: to eat 3 or 6 meals a day? Does it really matter if I skip breakfast? Because meals can be a central part of our social life—and busy training schedules can contribute to chaotic eating patterns—many athletes disregard the fact that food is more than just fuel. When (and what) you eat impacts your future health (and today’s performance). Food consumption affects the central clock in your brain. This clock controls circadian rhythms and impacts all aspects of metabolism, including how your organs function. Restricting daytime food and eating in chaotic patterns disrupts normal biological rhythms. The end result: erratic meal timing can impact the development of cardiovascular disease (CVD), type-2 diabetes and obesity. Older athletes also want to stay healthy. In 2014, 14.5% of the US population was 65 years or older. Over the next 25 years, older Americans are expected to grow to 22% of the US population. We need to outlive the diseases of aging. That starts with fueling wisely on a regular schedule and enjoying regular exercise! If you define breakfast as eating 20% to 35% of your daily calories within two-hours of waking, about one-fourth of US adults do not eat breakfast. This drop in breakfast consumption over the past 40 years parallels the increase in obesity. Breakfast skippers tend to snack impulsively (think donuts, pastries, chips and other fatty foods). They end up with poorer quality diets and increased risk of diabetes, heart disease, high blood pressure and overweight/obesity. Eating a wholesome breakfast starts the day with performance enhancing fuel at the right time for your body’s engine. If you exercise in the morning, fuel-up by having part of your breakfast before you workout and then enjoy the rest of the breakfast afterwards. This will help you get more out of your workout, improve recovery—and click with natural circadian rhythms. Meal Frequency: Is it better to eat 1, 3. 6, 9 or 12 times a day? In terms of weight, eating 2,000 calories divided into 1, 3, 6, 9, or 12 meals doesn’t change your body fatness. In a study where breakfast provided 54% of the day’s calories and dinner only 11% of calories—or the reverse, the subjects (women) had no differences in fat loss. Yet, in terms of cardiovascular health, the big breakfast led to significant reductions in metabolic risk factors and better blood glucose control. The bigger breakfast matched food intake to circadian rhythms that regulated metabolism. Athletes who skimp at breakfast commonly get too hungry and then devour way too may calories of ice cream and cookies. If they do this at night, when the body is poorly programmed to deal with an influx of sweets, they are paving their path to health issues. Hence, if you are eating a lot of calories at night, at least make them low in sugary foods, to match the reduced insulin response in the evening. This is particularly important for shift workers, who eat at odd hours during the night and tend to have a higher rate of heart disease. Should you stop eating after 8:00 PM? There’s little question that late-night eating is associated with obesity. Research with 239 US adults who ate more than one-third of their calories in the evening had twice the risk of being obese. Among 60,000 Japanese adults, the combination of late-night eating plus skipping breakfast was associated with a greater risk of diabetes, heart disease and obesity. A study with 2,200 US middle-aged women reports each 10% increase in the number of calories eaten between 5:00 PM and midnight was associated with a 3% increase in C-reactive protein, a marker of inflammation. Inflammation is associated with diabetes, CVD and obesity. Wise athletes make a habit of eating the majority of their calories earlier in the day, to curb evening eating. The best plan: Plan to eat intentionally. Failing to plan for meals can easily end up in missed meals, chaotic fueling patterns and impaired health, to say nothing of reduced performance. If you struggle with getting your food-act together, consult with a sports dietitian who will help you develop a winning food plan. Use the referral network at www.SCANdpg.org to find a local sports RD. Instead of holding off to have a big dinner, enjoy food when your body needs the fuel: when it is most active. If you worry you’ll eat just as much at night if you eat more during the day (and you’ll “get fat”), think again. Be mindful before you eat and ask yourself: Does my body actually need this fuel? Most active women and men can and should enjoy about 500 to 700 calories four times a day: breakfast, early lunch, second lunch, and dinner. To overcome the fear that this much food will make you fat, reframe your thoughts. You are simply moving calories in your pre- and/or post-dinner snacks into a substantial and wholesome second lunch (such as a peanut butter-honey sandwich, or apple, cheese & crackers.). The purpose of this second lunch is to curb your evening appetite, refuel your muscles from your workout earlier in the day (or fuel them for an after-work session) and align your food intake to your circadian rhythms. Give it a try? Sports nutritionist Nancy Clark MS RD CSSD has a private practice in the Boston-area (Newton; 617-795-1875), where she helps both fitness exercisers and competitive athletes create winning food plans. Her best-selling Sports Nutrition Guidebook, and food guides for marathoners, cyclists and soccer are available at nancyclarkrd.com. For workshops, see www.NutritionSportsExerciseCEUs.com . Hello sir, I just stumbled upon your fantastic podcast! Already listened to 5, great host, great guests, great subjects. The information contained within is a literal goldmine. I would love to contribute an article for your consideration if I could be so bold. I'm 43 this year, I've been lifting on and off for 20 years. I think I've got a pretty good physique for my age, I've never taken anything more than creatine and protein powder (won't ever fall for that propaganda again, but that's another story ) when I started training I was 160lb at 6,2 I could get two hands around the top of my thigh. I was the guy on the beach that had sand kicked into his face by Charles Atlas. drug using bodybuilder workouts will not work for you! Compound exercises should comprise the majority of your workouts! No supplement is better than food! The muscle magazines and every pro bodybuilder are lying to you! Low rep, high intensity workouts are better for you than high rep low intensity! Having big muscles but being weak is not a benefit! A six-pack is not really important to your life! Unfortunately for me, this took me nearly 20 years to work out, but I'm not bitter. I'm happier with my training than I've ever been and stronger than ever. I Squat, Bench, Deadlift, Chin, Row, and Press alternating twice a week. They can keep their ego driven training in the magazine's for the goons, hard heavy infrequent training is the real deal. No matter your age or gender, there's time to change for the better. Keep lifting ! In my last article, I described a general plan for getting in shape and getting stronger. The beginning of a new year, traditionally, is a time to start an exercise regimen. For most trainees, their exercise goals fall into one of two general categories: Gaining muscular mass, or losing excess bodyweight. Generally, those who want to increase their muscle mass are younger. Beginners, in particular, want to gain size and strength. When it comes to losing weight, it is usually the "older" trainees whose goal it is to drop some unwanted pounds. On the other hand, there many older trainees who don't necessarily want to lose weight. Rather, they still desire to build strength and lift heavy weights. There are many people who, having worked out in the past, wish to resume an exercise program. People fall into this category for any number of reasons. Job, career, and family responsibilities are the biggest reasons for discontinuing an exercise regimen. Anyone who has any kind of medical problem, and those who have not been active, but are eager to begin, should check with a physician before embarking on a Strength Training program. Those who were never very active, but are now contemplating a weight-training program, should undergo a complete physical to be on the safe side. It makes no sense for a sedentary individual try engage in an intense strength-training. Such a mistake could lead to serious injury. Always be smart. Those who trained in the past, and are in fairly decent condition, might have to make some adjustments, particularly if they find themselves lacking energy after their workouts. Sometimes it's better to reduce the number of sets of an exercise. Or even reduce the number of workouts performed in a given week. Many times, especially after a long layoff, people try to do too much. What makes things worse is if they try to follow the so-called "routines" found in the popular muscle magazines. Too often, these "routines" contain too many exercises , too many sets, and too many workouts per week without sufficient rest and recuperation. Sometimes, when it comes to lifting weights, less is more. You have to listen to your body. You know your capabilities better than anybody else. Perhaps you can't lift three days per week, or even twice per week. At least not at first. In that case, you should settle for once per week, until your body becomes accustomed to the increased load placed upon it. Many trainees haven't actually trained hard for a long time. Perhaps even years. But they think they can do something they did when they were actively working out. As you get older, you have to train smarter. And sensibly. This means keeping your ego in check. That's why after laying off for a few months, most people, especially older trainees, will find that the weights they are using "feel heavy," when they resume training again. Then there are the individuals who are beginning a training program who have never lifted weights before. Many times they are so hyped about training when they first start, they can't resist training to capacity every day. Most people who try such an approach lose interest and quit. We've all seen people like this. It's better to start slowly and keep your mind hungry for more. Do not overtrain. Remember, you can "burn out" mentally as well as physically. Slow and steady will always win the race when it comes to building lasting strength and health. Size and strength that is developed slowly will endure longer. Beware of anybody who tries to sell you on any shortcuts. That's why you should avoid the "muscle magazines. " They are not usually genres for a typical, drug-free trainee. In lifting, as in life,my out reap what you sow. For those trainees who are over the age of 65, by all means continue to train. Just remember that there is no reason for anyone to attempt something that he/she has done two or three decades earlier. Yes, you should definitely lift weights if you can. If you continue to feel good about your training, then you don't have to make any changes to your program. However, if you find that you can only lift once per week, you can still engage in a comprehensive exercise program. Walking, swimming, riding a stationary bicycle are effective alternatives to lifting weights. Remember, you can do less lifting and still remain active. Just don't fall into the trap of inactivity. Don't just sit around and fall into a sedentary lifestyle. Try to be more methodical and remain active. By training sensibly, intelligently and consistently you can maintain your enthusiasm as well as your strength and health. One of the most memorable quotes that I remember came from Bob Whelan's training facility. "Regular workouts = long-term investment strategy." I've always remembered this because it is so true. It's not some flashy, gimmicky sales pitch. It's an accurate description of how you should approach your strength training. We're all in this for the long haul. By following a common-sense approach, you will build lasting strength and enduring health.